Best known writings are “Tropic of Cancer,” “Tropic of Capricorn,” and “Black Spring.” His works were banned from the U.S. until 1964 because of lewd content. Yesterday Frogger had a friend over. Among the parade of teenagers that run in and out of the house, this kid is one of my favorites. He’s a reader. He’s cerebral. A 16 year-old that reads Neitzsche! He’s the kind of kid that likes to blurt out politically incorrect statements — with a gleamy, little side-eye to see the reaction. He’ll say just what’s on his mind and damned the consequences. Dark rebel, that one is. Frogger likes everybody, but he worried if this particular friend would offend me and I’d throw him to the curb. He says, “Mom, he just says whatever is on his mind, don’t get offended.” On the contrary! Friend walks in once and says, “Hey, your house is not as messy as it usually is.” I could have been offended by that statement, but I was impressed that someone actually noticed that I cleaned up. Score one for friend. I offered him some rice that I was making for dinner. He says, “That was really good, but I didn’t like the bean in it.” You found a bean it your rice? One bean? Weird because I didn’t put beans in it. One random bean fell from the Heavens and ended up in the pot. Funny. When this kid comes over, I always like to show him my new “finds” from the used bookstores I frequent. My kids will listen when I blather on about a cool book I found, but it is similar to a hand-patting, “Oh, that’s interesting, Mom.” Moving on… Point is, this kid likes my collection of books and I like to ask him what he’s currently reading. I’ll lend him a book or two from my “special” bookshelf of all my favorites because I know that he will appreciate and take care with them. Last night, he found one of my copies of Dante, “The Inferno,” and asked me if I had another printing because he wasn’t crazy about version he found. Which lead me on a hunt to find my other copy of “The Inferno,” which is where I found my gem. There was a biography on my shelf that I had never gotten around to reading, so naturally, I got distracted from my original mission to check it out. Inside the cover of the book was a handwritten letter from Henry Miller to a Dr. Glassell, who is the founder of Glassell School of Art and part of the Museum District here in Houston. Now I am really curious. Dr. Glassell is an important figure here in Houston, and Mr. Miller is an important literary figure; how in the world did this letter get into this book and into my grubby little hands? 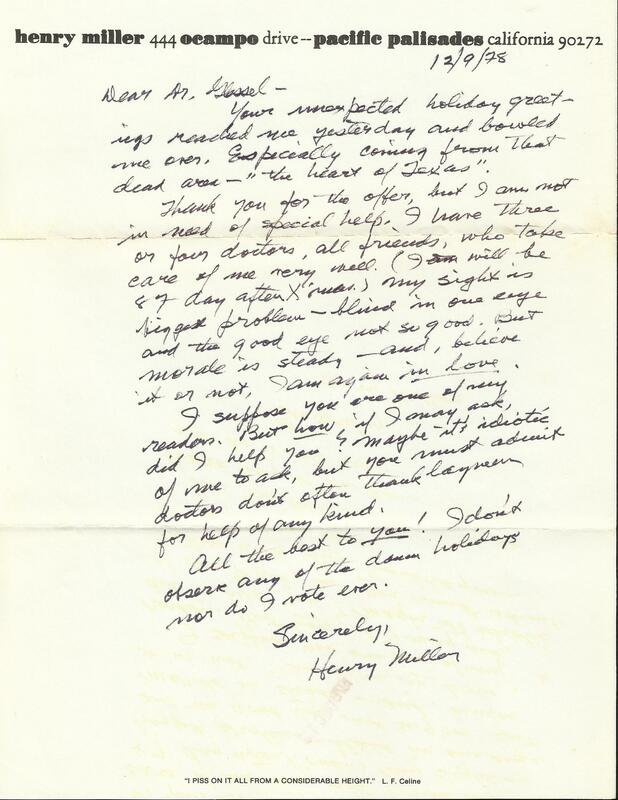 I looked online and found letters similar to this one valued at $5,000!! Holy crap! My first thought was, “Nobody touch it! !” My fun project today is to see if I can figure out how to authenticate it. The last line reads, “I don’t observe any of the damn holidays nor do I vote ever.” Charming. If y’all have any feedback or information about something like this, let me know.